Kyle Tellstrom finished last for the first time in his NASCAR K&N Pro Series West career during Saturday night’s NAPA Auto Parts Idaho 208 at the Meridian Speedway when his #91 HD Power Systems / Pit Stop USA Chevrolet fell out with engine problems after 14 of 208 laps. The finish came in his series debut. Twenty-three years old and from Ukiah, California, Kyle Tellstrom has been racing since his formative years. His developmental path included the traditional outlaw karts, Legends cars and Bandoleros, racing at Ukiah and Lakeport Speedways. He stepped up to the Lucas Oil Modified Series in 2014. He's balanced a partial schedule in modifieds while attending Boise State University, and as William Byron will tell you, college and racing are a tough couple to manage. Tellstrom also transitioned into racing with closed-fendered cars, winning his first super late model race this summer, coincidentally at Meridian. That win was around the time that he got a roller from John Wood containing the parts to build a K&N car. Tellstrom and two others worked on the car over the summer to get it ready, but didn't announce his debut until Spetmeber 24 – a mere five days before the race. Expectations ran high due to previous experience at Meridian and the performance backed it up – he finished fourth in first practice. The entry list was back down to a normal size for a West race at fifteen cars. Taylor Canfield, driving another car out of the Wood stable, the #32 machine. It marked his series debut. Four other part-time drivers rounded out the non-full time entrants: Travis Milburn returned to the 08 car, Andrew Koens to the 77, Jeff Jefferson in the 27, and Pro Mazda driver Sting Ray Robb (yes, that is his real name). Robb would make his first start of the year, driving yet another entry from the Wood team, #36. Former US Olympic bobsledder Nick Cunningham had hinted at plans to run this race, but the hints never came to fruition. Robb trailed first practice, his fastest lap six-tenths of a second slower than leader Derek Kraus’ lap around the quarter-mile track. 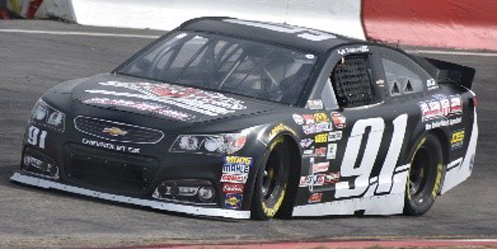 Hailie Deegan led second practice, in which only twelve cars participated. Canfield, the only driver not to turn a lap in first practice, anchored the second session, his lap a second slower than Deegan’s fastest, and comparable to the best lap by Kraus. In qualifying, Canfield trailed as well, running a 14.4-second lap, two-tenths slower than his fastest practice lap. 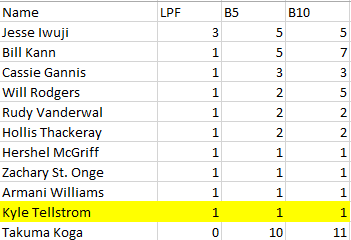 After qualifying tenth, Tellstrom looked set to have a solid debut, but drew the second caution of the night for a spin down the backstretch. Evidently, the 91 car had been battling gremlins before that, as the leaderboard indicated his car had less than seventeen laps complete total and the caution flag flew for him on Lap 17. Takuma Koga also fell into the “constant battle” category, going on and off the track during the first half of the race before retiring with 47 laps complete due to drive shaft issues. Travis Milburn was the only other retiree of the race, bowing out at the three-quarter mark with oil line issues. The last car running was Taylor Canfield, who had a rough go of it throughout the race. After a spin on lap two, he spun again on laps 124 and 190, the latter one forcing then-leader Derek Kraus into the outside wall. Kraus later implied that Canfield was the reason that he did not win the race. Canfield’s #32 fell twenty-six laps down over the course of the race, while the car that rounded out the Bottom Five, Andrew Koens, was only three laps down at the end of the race.